Connecting two tunnels on opposing sides of the expansive Arazim Valley near Jerusalem requires building a record-breaking bridge that is as impressive in its height as in its length. The landmark €35 million project relies on six Potain tower cranes that are able to climb to final working heights of up to 115 m.
The rugged and uneven terrain on site added another challenge for the Kokhav Ya’ir-based Potain crane owners, COMASCO, tasked with installing tower crane foundations to ensure they were erected securely and in ample time for the bridge to progress on schedule. Working approximately 12 hours a day, six days a week, the top-slewing Potain tower cranes are performing general lifting duties and pouring concrete to build the girder bridge. The Potain cranes at the project include a 16 t capacity MD 365 B, two 8 t capacity MDT 178s and three 12 t capacity MD 285s. The cranes offer maximum jib lengths from 60 m to 75 m and can lift between 1.5 t and 3.2 t at jib end. The milestone project is a fitting tribute to COMASCO’s 50-year collaboration with Potain, as Mr Haim Danon, managing director, explained. The Potain tower cranes arrived on site in June 2013 and will remain at the project until the end of 2015. All six cranes are climbing units, anchored to the pylons they are building. 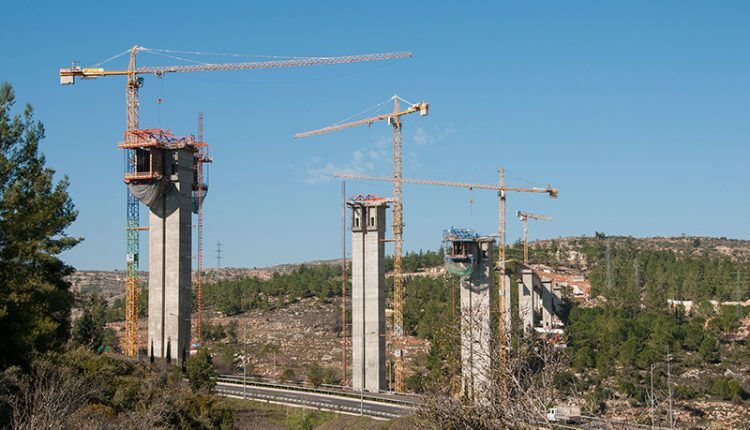 Due to the varying gradient of the terrain, the cranes stand at different heights and their final working heights will extend up to 115 m.
As part of the Israel Rail Road Project, the bridge is a crucial part of what will be a vital 70 km rail connection between Tel Aviv and Jerusalem. Once completed it will be the tallest and longest bridge in Israel. Established in 1963, Comasco is among the largest equipment suppliers in Israel.